Today is a Very Busy Day full of me baking shortbread, owing to the fact that I really can't feel happy about not getting cookies out to all my neighbours over the Christmas break. I'm not even super happy about putting on a Happy New Year! tag in place of the Merry Christmas! one, so I will definitely have to adjust my planning for next year, but more on that later. What I want to tell you over my tea and toast (my motto: multitasking is good unless it involves tea and/or toast falling into your keyboard) is that I FInally got something else done that was very important to me. 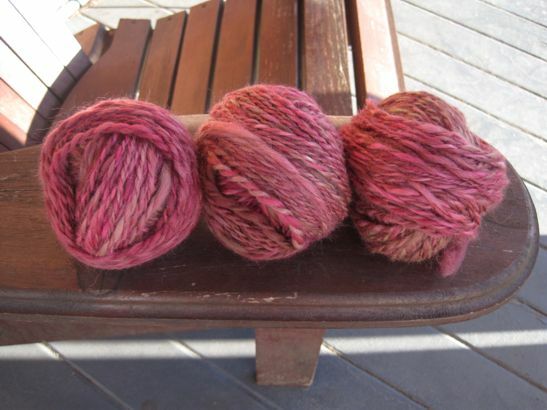 That's six ounces of fiber, that is, and I spun five and plied it all in just one day, which is a record for me. Best of all: even after not spinning for so long, I still got all the fiber out looking pretty consistent for gauge, so I can probably making a Real Thing with it.